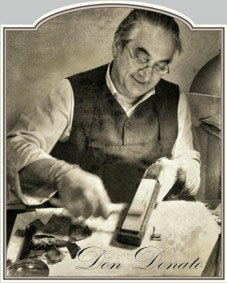 Extrò Cosmesi shaving creams are handmade by Donatao Ciniello the old fashioned way, in Settimo, Torinese, Italy. Free of parabens and alcohol these artisan shaving creams include vegetable-based ingredients, making them ideal for sensitive skin sufferers. Packed in a heavy glass jar, which is characteristic of all Extro shaving creams; Del Don possesses an intoxicating fragrance. It has heart notes of lavender, thyme and cassis, a warm base of amber, patchouli and guaiac wood, and is accented by delicate top notes of mandarin, basil and lily of the valley. The shaving cream is enriched with Jojoba oil which is hydrating and has skin friendly, anti-inflammatory properties. It will nourish, restore and protect your skin. Although classed as a shaving cream its consistency is a cross between a soft cream and a hard soap, similar to putty. When lathered up it produces a rich, creamy, protective lather. Pair this shaving cream up with the matching Del Don Aftershave Eau de Toilette for the complete Del Don shaving experience. Del Don shaving cream is very rich in its consistency, a small amount goes a long way. For best results use with a shaving brush, wet the brush in warm water, flick off excess water and gently apply the brush to the cream. The wide diameter jar is large enough for you to swirl your shaving brush in, load up sufficient lather and paint this into your beard bristles. Oh yes, Del Don is ever so good. We love this Italian brand, unusual, sensual scents, protective lather and nice packaging that looks good in the bathroom. Stearic Acid, Aqua (Water), Coconut Oil, Potassium Hydroxide, Sodium Hydroxide, Parfum, Simmondsia Chinesis Oil, Benzyl Salicylate, Limonene, Linalool, Coumarin, Butyphenyl, Methylpropional, Citronellol, Geraniol, Benzyl Alcohol, Eugenol.